The UL-biplane "Kiebitz" is a look-a-like with the 1927-built Focke-Wulf S-24 "Kiebitz" also known as the "Peewit". 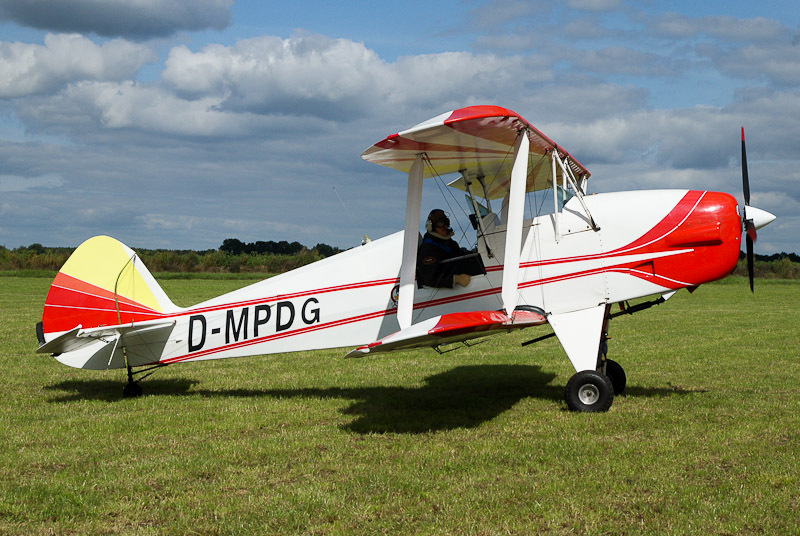 The modern "Kiebitz" was designed by Michael Platzer originally as an UL-biplane with a max takeoff weight of 330 kg. The UL-biplane "Kiebitz" is available in plan form since 1984. The UL-biplane Michael Platzer Kiebitz has been further developed from the 1984 "Kiebitz"; also knwon as Kiebits A into the Kiebitz-B (450kg) with a max takeoff weight of 450 kg. The Kiebitz has a steel-tube fuselage and tube-and-fabric wings. Powerplants up to 100hp can be used. The engine used on the Kiebitz determines the serie number of the Kiebitz: A - Göbler-Hirth F2703; A9 - Nissan / Platzer MA-12-P; B1 - Göbler-Hirth F2703; B2 - Rotax 462; B3 - Rotax 532; B4 - Rotax 582; B5 - Rotax 582; B6 - Limbach 2000; B8 - Sauer 2100; B9 - Nissan / Platzer MA-12-P; B10 - Henning Motor; B11 - Walter Mikron; B12 - Cloes / HC5; B13 - UL-Power 260i and B15 - Rotax 912. The Kiebitz B14 is reserved but the engine type is not yet known. The Nissan / Platzer MA-12-P engine of the Kiebitz A9 and the Kiebitz B 9 is Platzer's own modified Nissan Micra car engine. Over 400 Kiebitz biplanes already have been build by homebuilders throughout the world. When You want a new Kiebitz, You have to build it Yourself in accordance with the drawings! It costs a lot of perseverance: building a Kiebitz will take about 1500 hours. If You lose courage: it is possible to purchase some parts, like the under-carriage. Platzer Kiebitz B2 c/n 041 was registered D-MPDG in Germany in 2001. The aircraft was one of the visiting aircraft at Fly-in Gees at the temporarely MLA-airfield near Gees in Drenthe, the Netherlands, on 1 September 2012.